Discussion in 'Small Form Factor Systems' started by jb1, Jul 28, 2015. I have also in the past weeks developed some new Risers. I can provide any combination of x8, x4 and M.2, custom dimensions and mounting holes etc. This for example is meant to extend a mini ITX Board to fit into an mATX case with one x8 GPU and two additional x4 slots. I am working on a small webshop to sell them in the future. Also Asrock has been nice enough to enable x4x4x4x4 on their x99e itx/ac if anyone needs that bios please let me know. That's awesome. I enjoyed watching everyone in the comments on that one freak out because they'd never heard of PCIE bifurcation before. I'm curious, with PCIE 4.0 on the somewhat near horizon, do you think your crop of bifurcated risers will be forward compatible with the new standard? 2 x8 4.0 lanes is quite a lot of bandwidth to play with. Well I cant be sure, but I do think so. The Clock-Buffer I choose is gen 4 compliant already. PCIe gen4 connectors are improved versions and only SMT. I routed for an impedance Target of 100Ohms, it should be 85 now. 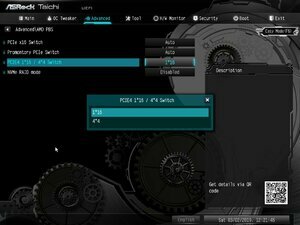 In typical ITX build trace length is short. PCIe gen4 per spec only allows one connector between endpoints. These are 7 Connectors between endpoints. A lot of users have actually been stacking more then one riser without issues. I will find out and certainly make a redesign should they not work. I dont think one would really need to use retimers as it would make them more expensive by an order of magnitude. But I do think that the common setup with flexible risers may not work anymore. Would love to get the x4x4x4x4 bios for the asrock x99e-itx/ac. Also, do you have an x4x4x4x4 riser? Thanks. I currently have no x4x4x4x4 PCBs on hand, but I could make one to your spec. Just drop an email risers@peine-braun.net, I will send you that bios. I was wondering, I found this bifurcation chat some time ago while researching. I'm having some trouble getting my bifurcated setup working, normally I know how to troubleshoot stuff, but this is getting into the realm of "never even heard of that" for most people. I've got windows server loaded onto the boot drive, gone through the nightmare that is LAN drivers for this board on Windows Server (not provided and cannot install), even managed to get the wireless card working. Now I'm having issues with getting my Hyper M.2 working. Sometimes it boots and recognizes it, other times it doesn't. I've heard other people mention that when they have issues with their Hyper m.2 cards and they don't recognize drives the LED lights on the side will turn off. So if you have 1 m.2 connected, one light will be on, 2 is two lights and so on and so forth. My device (when it powers up) has all 4 lights on but only shows one 512gb drive in disk management. Is there any way to troubleshoot this? I have emails from ASUS where they explain to me that I was correct in some earlier inquiries and that the Hyper M.2 will work with any motherboard that has x4x4x4x4 bifurcation enabled AND I have the modded Bios from Asrock that enables x4x4x4x4 bifurcation. They mention that x8x8 works correctly, I'm going to try to change over the bios to x8x8 tonight in order to see if that enables a second drive. I'd love any other suggestions that anyone might have. I hope asrock won't mind me sharing this with you publicly. Also I am currently writing a summary on PCIe Bifurcation, so if you have a working Bifurcation Setup please drop an eMail to risers@peine-braun.net or PM with your mainboard, bios revision or mod-bios and tested modes (e.g x8x8, x8x4x4). chemist_slime and Neapolitan6th like this. This is all seriously [H] level stuff. Good job y'all. 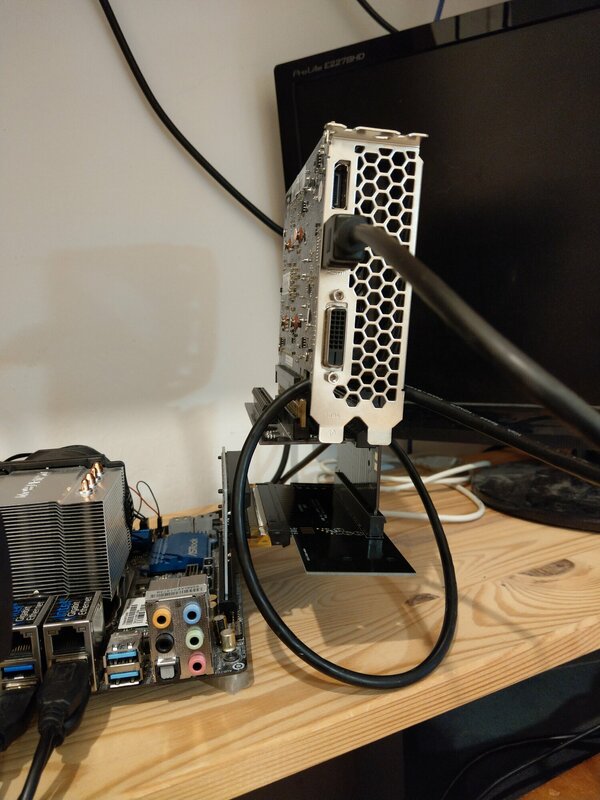 Hi C_Payne, I am really interested in the card that "extend a mini ITX Board to fit into an mATX case". I hope you will be able to put some up for sale. I would recommend selling on ebay as it will do all international shipments. What price can you expect to sell them ? It supports Paypal Express Checkout. There is also some information I have collected concering bifurcation there, this is however work in progress. Any additions would be greatly appreciated, please drop a pm or eMail. I have a general question on the Bifurcation. 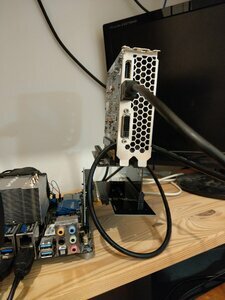 If you split a slot to 4x4x4x4, and plug in a 8x pcie device. Would the device use a single 4x slice, or would it recombine the two 4x ? I have Gigabyte Designare x399 board, and all it can do is split slots to multiple of 4x in BIOS. And I would prefer 8x splits. Unfortuantely that will not work, maybe it wont even POST. However Gigabyte may add it, just write a support request to them. Shouldnt be to much work for them. Wouldn't an active riser with PLX chip always be better than using bifurcation? (besides higher cost that is). I'm interested in using for example RSC-R2UG-A2E16-A as earlier mentioned here, for compute purposes where the bandwidth between the GPU's is an important factor. Oh sweet, I'm having issues with dual Titan Xps under Windows 10 as well. It just freezes when the driver is installed. I'll send an email to them as well asking for the 3.64. I'm currently on 3.63. Would you recommend using the PLX riser you tried all the way back in the beginning of this thread? Looks like the RSC-R2UG-A2E16-A would actually fit in a HP MicroServer Gen8, with riser cables for the cards of course. The ×16 slot on it only runs in ×8 mode at most though, does anyone know if the RSC-R2UG-A2E16-A would still work in an ×8 mode slot? 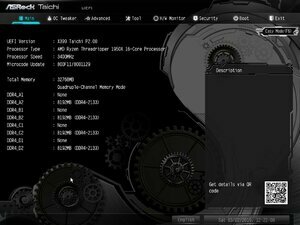 I have an Asrock x399 Taichi with a Threadripper 1950x and I'm interested in trying to run 2 gpu's at x8/x8 on 1 x16 pcie slot. 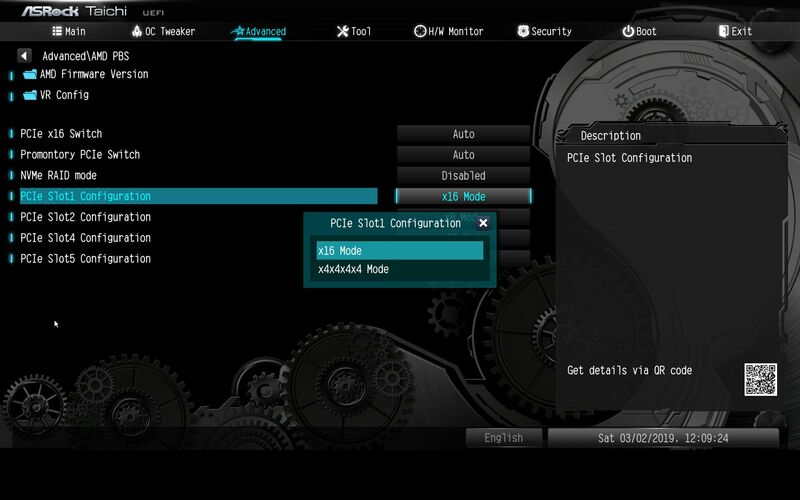 Currently the bios only has an option to split the x16 slot into x4x4x4x4 mode. 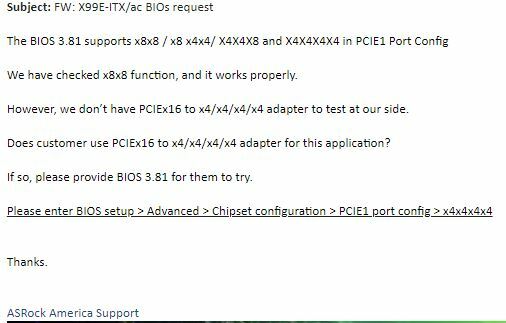 I'm actually trying to put in a feature request with them to support x8x8 mode on the next bios update. Bios features aside, if x8x8 were supported, would using one of your splitters be all I would need to run 2 gpu's on 1 slot? Or is there some other system settings/controller chip trickery that would also need to happen? I thought x8x8 was supported since BIOS 2.00c, what bios are you on? Can you go back to 2.00c and see if it's in the list (if you are on a newer bios)? The splitter should be all you need. Where are you getting the info that x8x8 mode is available? I really wish it would work with the system I have right now. Seems like such a waste to have all those lanes coming out of the Threadripper, but not be able to split them in a practical way. Could you contact ASRock about this? As far as I've seen they've been providing custom BIOS to people who requested it, it should also be possible to edit the BIOS, I might give it a go if I face the same issue. *Edit: I see you already did, I also contacted support, will notify here if I get any word. Only slot 1 & 3 would have x8x8 as 2 & 4 are getting 8 lanes. 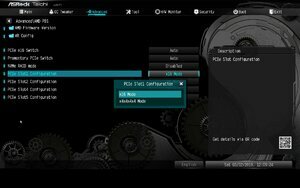 *Edit2: upon inspection of the BIOS with AMIBCP 5.02 I can't see any setting to add/change the bifurcation settings. *Edit4: Have you tried beta 3.33D? Yes, contact them and they'll sell it to you. 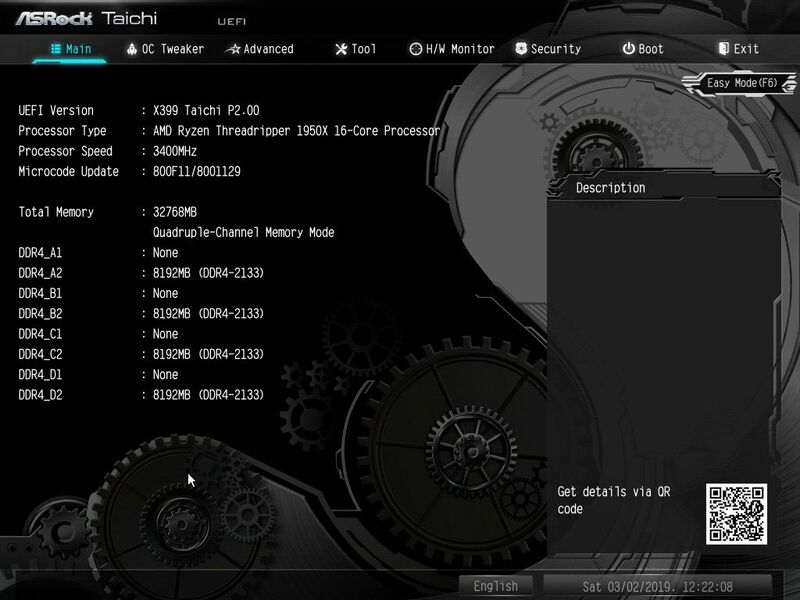 For those seeking to have x8/x8 bifurcation on the ASRock X399 Taichi, you'll need a custom BIOS L3.51. Contact me if you want it, not sure if I can share it publicly. Thanks ASRock! How long does it take for ameri-rack to respond? 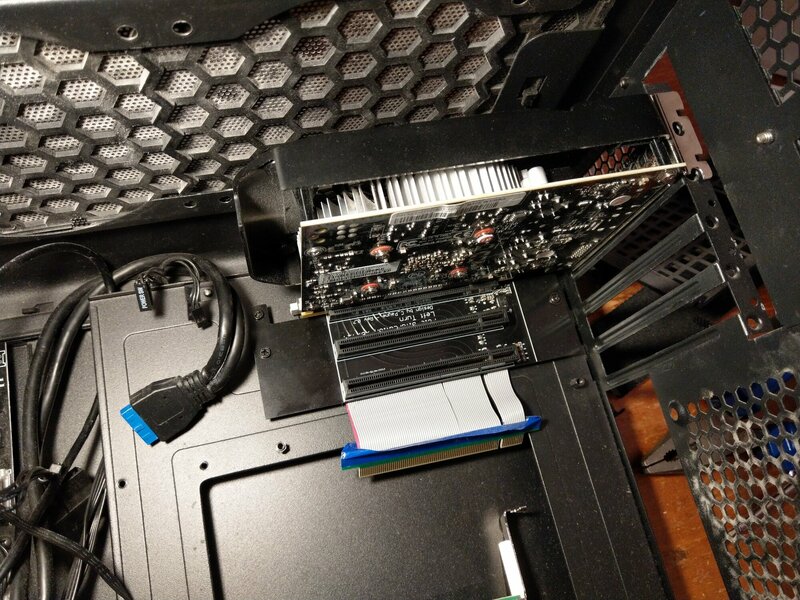 I want a few of the flexible 2x8 risers, for some ITX servers for my homelab (I need 10Gb SFP+ on all of them, and a GPU on 2 of them, and an HBA card on one of them as well. Going to use AsRock ITX AM4 boards). I emailed them about a year ago and never got a reply, but I emailed again yesterday asking for pricing and a shipping estimate and haven't yet gotten a response. Awesome to see C_Payne's shop up and running! If I can't get an ameri-rack one I might have to buy from there, but I really do need the flexible one. Hello, Tilde, I am already give up to use ameri-rack to retrieve a flexible 2*8 risers, I am also have the requirements to getting 4*10Gb SFP+ and also 4*1Gb POE(48v) ports. And Now I am not using flexible riser but using a fixed 2*8 riser. I'd like to post a URL for you to buy, but comes from China. 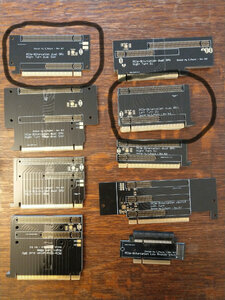 And besides, I am also ask for someone designing a custom ITX-box for two 2*8 PCI-E card(Full height). Are you selling the Ameri-Rack ones? If you could send me a link so I can check if they're the right size that would be great! That's an interesting case design, but one problem I see is the GPU is going to have almost no cooling because of the PSU being in the way. EDIT: I got a reply from Ameri-rack, I won't need your ones. 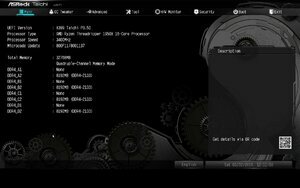 I'm curious as to how exactly some of you guys got in contact with asrock support regarding bios issues. Was it through https://event.asrock.com/tsd.asp ?? Reading this thread while helping a friend figuring out bifurcation issues regarding a 4slot m.2 adapter card reminded me of a issue I have with one of asrock's mITX boards regarding fan pwm controlling. Does anybody know if the ASRock Fatal1ty B450 itx boards support x8/x4/x4? I've reached out to them but haven't received a reply yet. The epycd8-2t also does x8/x8 and x4/x4/x4/x4, giving a possible 11 Pcie x8 fully connected to CPU! Or 24 x4 if you include the 2 m.2 connectors. Combined with a 100 gbit nic it'd move data faster than throwing a drive down the hall. 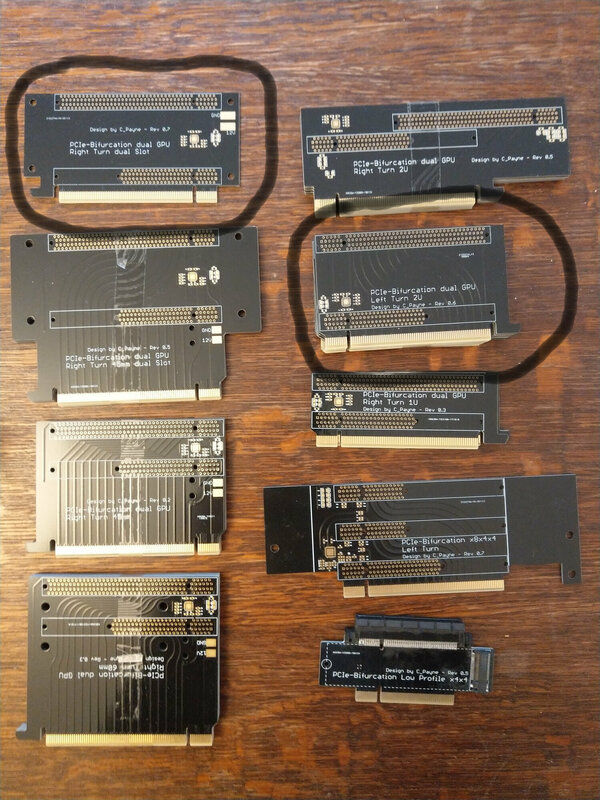 Anybody have a list of boards that support x8/x4/x4? Preferably AM4. I contacted AsRock about the b450 fatal1ty itx and got told it only supports x16 or x8/x8. Ryzen only supports x8x8 on its lanes. Any recent Intel CPU can work in theory, depending on bios support. Asrock has been a good choice for this. Asrock has been a good choice for this. Hmm, I'd prefer AMD as a similarly priced intel system is literally half as powerful CPU wise (2200g + board vs Celeron/Pentium gold + board). The end goal for this system is not to be powerful, I want it to just be a NAS, but in the meantime it will be my main server so it can't be too weedy. I plan for up to 18-24 drives, so I can't go too low end (need 4 lanes for 10g card, 8 lanes for SAS card, and then it depends on which SAS expander I buy if I'll need more. Some SAS expanders need pcie power, some can run from molex), but I might be able to get away with just x8/x8. We'll see. So my shop will be offline for a while, I will try to at least get the mailserver running again tonight, you will then be able to reach me via risers@peine-braun.net again.